Give people a chance to pop a question to POTUS and they'll take the invitation and run with it. President Barack Obama has taken to Twitter for his first Q-and-A since setting up his @POTUS handle. 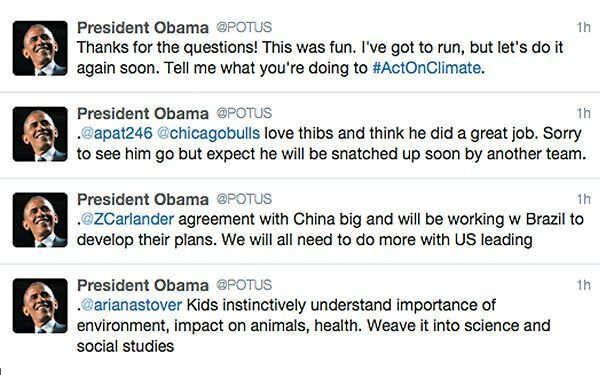 The suggested subject from POTUS (short for President of the United States) was climate change, but plenty of tweeps were having none of that. Sure, there were ample questions about climate change and other serious subjects such as trade and education, but others asked the president about everything from his favorite breakfast cereal to the Blackhawks' chances in the NHL western conference finals. He got the boxers-or-briefs question that once tripped up President Bill Clinton and someone even sent him family photos, with no question attached. @POTUS #AskPOTUS have you ever watched bee movie? The real question to #AskPOTUS who you got? @cavs or @warriors? @POTUS Are you struggling with the 140 character limit when answering these questions? Well, yes, the president did have issues with the 140-character thing, as one of his answers was a two-part tweet and another was a three-parter. "The heart of the Cavs is Lebron," Obama told one questioner, a reference to LeBron James, who returned to the Cavaliers in 2014 and led Cleveland into this year's NBA Finals. Obama also said he was sorry about the recent firing of Chicago Bulls head coach Tom Thibodeau. "Love Thibs and think he did a great job. Sorry to see him go but expect he will be snatched up soon by another team," Obama said. "Thanks for the questions! This was fun. I've got to run, but let's do it again soon. Tell me what you're doing to #ActOnClimate." Critical thinking challenge: Why might the president have struggled with the 140 character limit when answering questions? I think it is very interesting to see the president talking to the american people and answering their questions, I hope relations with the president will always be good. This article is about the president. Obama set up his twitter account named POTUS for President of the United States. He recently started his first Q&A, where he has been answering all kinds of questions from followers. These questions range from serious to ridiculous, like " Is a hotdog a sandwich." I think that it is great that Obama is trying to connect more with the citizens. 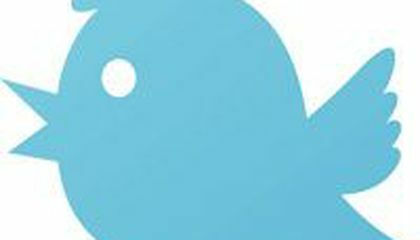 This article is about a recent Twitter account to have been opened by the President. It gives people the chance to directly question the President on different topics. People ranged from personal questions, sports questions, climate questions, or political-economic questions. I would really like to check this out as I would have interest in this. I currently enjoy modern political events so directly hearing from the President would be awesome. I have questions that I would want to ask him but would not want to be on my record forever... Mostly things about the NSA or the idea of Communism. That could severely end up hurting my chances of a political career if I ask the wrong question. Either way I may check it out and ask less controversial questions.